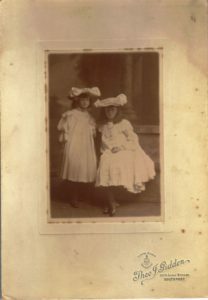 The two girls Pamela and Phyllis Gartside-Tipping figure on a couple of photos held in the family collection. Their mother was Mary Jane Pilkington, the great niece of Martha Marten, stepmother to the children of Henry John Marten. Henry Thomas Gartside-Tipping married Mary Jane Pilkington in 1890. She was the daughter of Lady Pilkington. Her stepfather was Sir George Augustus Pilkington(ne Coombe). After the marriage the family moved to the Isle of Wight, where Henry had inherited a property. Sir George and Lady Pilkington continued to live in Southport, where Sir George, a doctor, was MP for a time. We can imagine the regular trips from the Isle of Wight to Southport included a stopover at the Birches Codsall. The couple had three children Phyllis (b 1892), Vernon (b 1894) and Pamela (b 1895). Vernon died aged 17. Both parents were to die in the First World War. The father was killed in command of a Royal Naval yacht off Zeebrugge in Sep 1915 – the oldest Naval Officer to die in the War and the mother was a nurse shot dead by a deranged French soldier in France in 1917, for which she was awarded the Croix de Guerre. Phyllis married a Henry Richardson in 1918 and seems to have been a keen yachtswoman like her father. She died in 1955. Pamela Gartside Tipping died in 1924, aged 29. 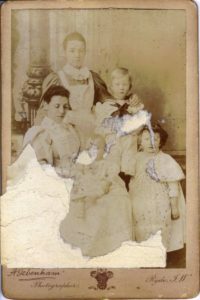 The photos were kept by and are identified on the back in the hand of Molly Evans, the step grand-daughter of Martha Marten.